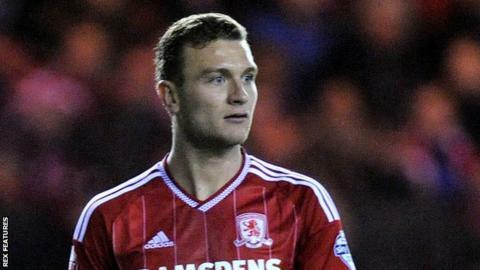 Middlesbrough defender Ben Gibson says Tuesday's defeat by Blackburn may be down to the fact they did not "want" the victory as much as Rovers. Boro missed the chance to go top of the Championship as they lost 2-1. "A lot of us have got to take a long hard look at ourselves. We should never lose a game because we didn't want it as much as the opposition and I don't think we did," Gibson told BBC Tees. "We got bullied in a lot of areas on the pitch and we must be better." After a five-game winless run, Boro recorded back-to-back victories against Cardiff and Fulham but remain third after their defeat at Ewood Park. "There's no reason we should lose a game for want or desire or people needing it more than us, because we're the ones needing to get promotion and get out of this league," Gibson, 23, added. "People have been saying we've got games in hand next to our name, when really they don't mean anything unless you get points on the board." Boro's inconsistent form has allowed Burnley and Hull to leapfrog them in the table, but the Teessiders could return to top spot for the first time in almost a month if Hull slip up at Birmingham on Thursday and Boro beat Wolves at home on Friday. Gibson continued: "We haven't taken advantage of the opportunity we had. We've got to turn it round quickly for Friday because it's a game we've got to win and get going again."